Sneak away from back-home stresses and responsibilities to the warm, secluded mountain forest hideaway, Mountain Glory. 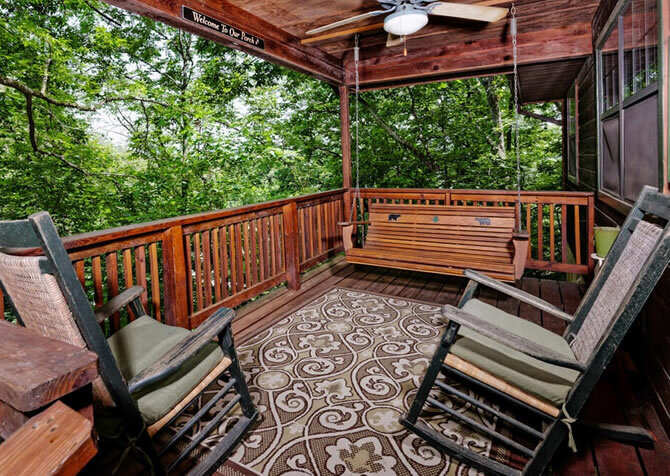 Walk out onto the back porch of this cozy 2-bedroom for a break from the world and escape to a rocking chair daydream with jaw-dropping views of the rolling Smoky Mountains. Mountain Glory is perfect for vacationing with a small family of 4 or getting away for some weekend fun with another couple! Make plans to take the kids to Dollywood or tour the Rocky Top Wine Trail with your friends before heading back to this rustic retreat. Perfectly positioned within short drives to both Pigeon Forge and Gatlinburg, you’ll have access to hundreds of downtown attractions. After a day of sightseeing and shopping, return to the cabin for a night of grilling out and hot tub therapy. The quaint cabin’s exposed wood and stone leads you to feel like you are roughing it, but the cushy king-size beds, flatscreen TVs, indoor jetted tub, and all the necessary kitchen appliances mean you do not actually have to go without modern luxuries while you are on vacation in the woods. 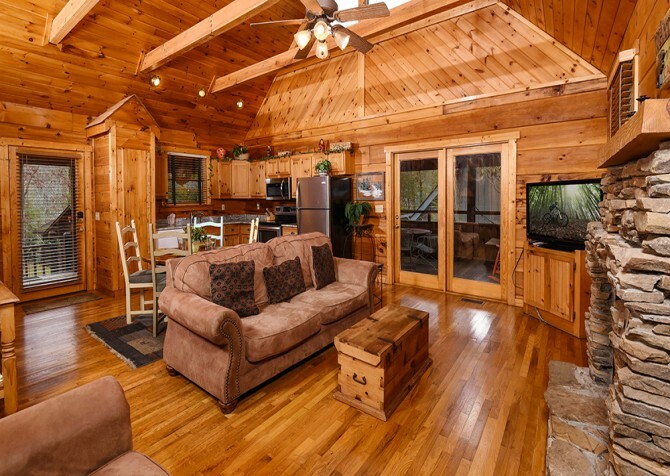 Unwind and reconnect with your family or friends while you lounge on the large couch, blackberry wine in hand from the Smoky Mountain Winery. Gather around the wooden coffee table for card games as you laugh and talk late into the evening. Set up a movie viewing area in front of the stone wood-burning fireplace for a special cabin movie night on the flatscreen TV for an entertaining time the kids are sure to love. Want a quieter night? Read in the atmosphere of rustic mountain décor and exposed wood beams taking you back to simpler times. Take a group hiking trip to Abrams Falls in nearby Cades Cove and reconnect with nature and the beauty you and the kids may have missing out on while eyes were directed to screens. 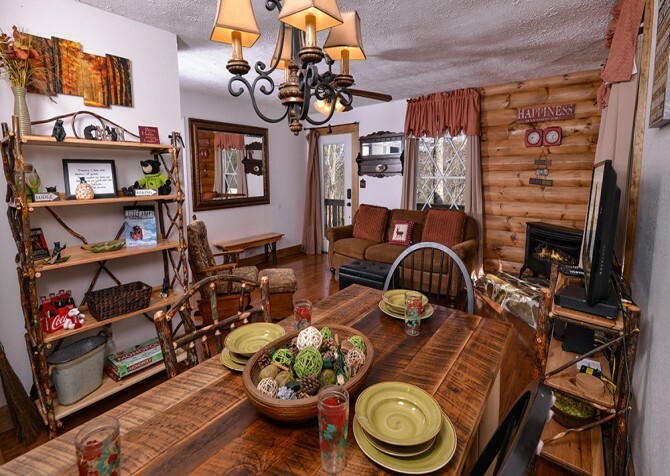 Mountain Glory may just put you in the mood to completely disconnect from modern technology and get to know uninterrupted life with friends and family while you escape in the Smoky Mountains. You are the celebrity chef in Mountain Glory’s quaint kitchen, with all the tools and appliances you will need to cook up that scrumptious signature dish! Open the dark wooden cabinetry to all the plates and cups for setting the table for dinner. Use the cutlery to slice carrots, celery, and apples for your planned picnic under the pavilion after tubing the Little Pigeon River with River Romp. Bring over the popcorn from the microwave and plop down on the nearby living room couch for the movie you picked out from the cabin’s library. Don’t skip breakfast; prepare your toast and coffee to enjoy out on the patio for a relaxing morning meal in the crisp mountain air. Easily store groceries and leftovers from Dolly Parton's Stampede in the spacious refrigerator. At the end of the day, come together over everyone’s favorite daily activity, dinner time! Laugh and toast to love and friendship under the light of a rustic chandelier. Play board games until late into the evening as you watch the sun fall and the moon rise over the Great Smoky Mountains through the dining room window. Sit the kids around the 5-chair table for coloring and games while you lounge around on the sofa nearby. Conveniently placed between the kitchen and living room means easy clean-up and a quick trip for a second helping! 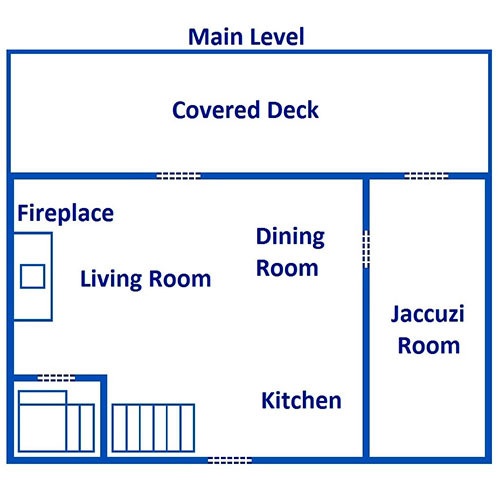 The 2 bedrooms in Mountain Glory are spaced out between the lower level and upper level for plenty of privacy if you are vacationing with another couple. Shower off from your day hike in either of the private bathrooms before lying down to relax and watch TV from the bed. Walk out for some night air before calling it a night with access to the deck in the lower level bedroom. Or you can enjoy the colorful dusk sky over the mountains in the bedroom upstairs. There is plenty of space for you to read under the soft light of the table-side lamp as your partner falls asleep. In the spacious king suite upstairs, get ready at the quaint wooden vanity while looking out at the mountains or read in the light of your private fireplace as you recline in the big sofa chair with a foot rest. Both bedrooms have plenty of drawer space to unpack your suitcases or unload those shopping bags after a day of shopping. 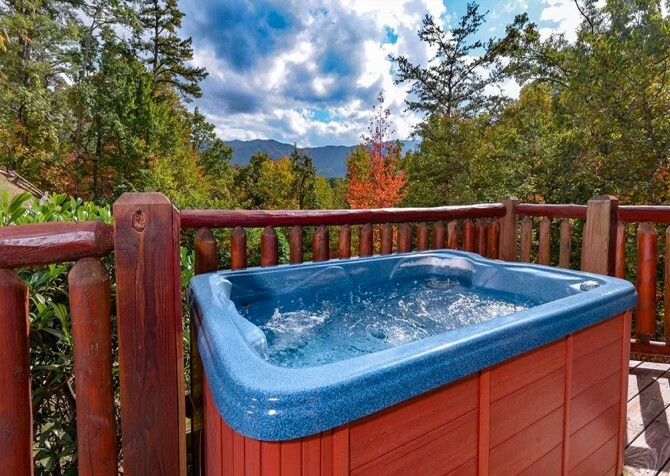 Lazily swing back and forth as you soak in the serene views of the Smoky Mountains from your cabin porch swing or watch over the kids as they get their own time in the bubbly warm waters of the outdoor hot tub while you safely stay dry in your rocking chair. 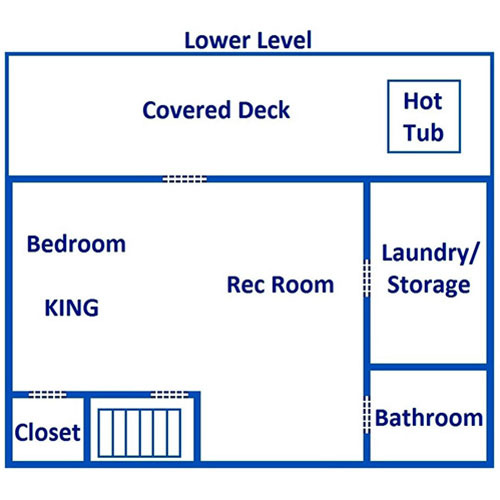 Later, after the kids are put to bed, you can sneak down to the kitchen to pour a glass of wine you bought at Smoky Mountain Winery and get some hot tub time to yourselves. On nice days, grill out on the charcoal grill and have a picnic lunch on the deck at the patio table in the afternoon sun shining over miles of mountain views. Soothe those tired muscles in the indoor jetted tub as you slip into warm waters at the end of a long day. Relax your mind as well with wooded views out the large window next to the tub and mountain views out the glass patio door. Let the steam calm your skin as you listen to your favorite audio book playing on your phone; don’t worry about using data to stream music or podcasts because Mountain Glory has internet access through provided Wi-Fi. You can even play foosball on the table inside! Fancy yourself as a thrill enthusiast? Take a roller coaster ride unique to the mountain landscape on the Alpine Mountain Coaster! Zip through trees and down rocky drop-offs in your single-car coaster ride; little ones don’t have to miss the excitement and can ride in the car with you, as well! Get your thrill during the day or at night when the track is lit-up with rainbow neon lights. At the end of your ride, compare and laugh at everyone’s faces from the candid pictures snapped along ride. Reach into the shallow lagoon of Touch-A-Ray Bay and make friends with the stingrays or walk through the real-life simulation of a tropical rainforest filled with all kinds of critters! Ripley’s Aquarium of the Smokies has over a dozen aquarium exhibits and experiences for you and your family to make awesome memories while you learn all about aquatic and rainforest life. Looking for a way to get out and really experience some of Tennessee’s great outdoors? Call and reserve a spot on the high-quality shooting range at the Gatlinburg Sportsman’s Club. Pack a lunch to enjoy under the pavilion overlooking their serene fishing pond where the club raises native fish to release into the streams around the area as part of wildlife conservation and support. "The pictures do not do enough justice! The cabin is bigger and roomer than we expected. Right in between Pigeon Forge and Gatlinburg. Maybe a ten minute drive both ways. The cabin is a perfect location because although close to atteractions, we are secluded in…"
"The pictures do not do enough justice! The cabin is bigger and roomer than we expected. Right in between Pigeon Forge and Gatlinburg. Maybe a ten minute drive both ways. 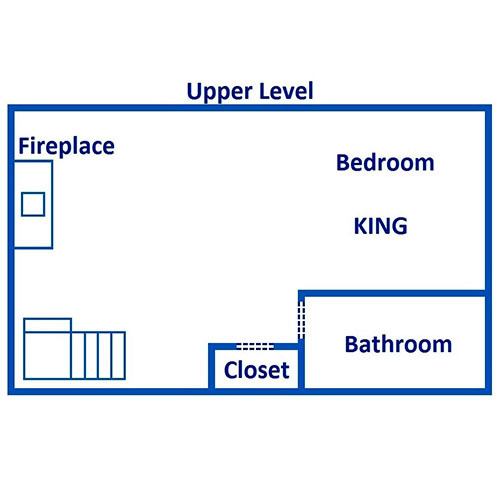 The cabin is a perfect location because although close to atteractions, we are secluded in a quiet area. The drive was steep up but my Kia Forte made it with no issues. So happy with our stay, beyond our expectations!" Thank you so much for the review! We are so happy to hear that you enjoyed the stay and that the cabin was more than you had seen online! We really are looking forward to having you stay with us again in the future. "My sisters and I rented Mountain Glory for 6 days in September. We started searching for rentals 8 months before. We chose Cabins for You, and we couldn't have been more pleased with the service. When we got to the cabin, it was more than we imagined! Although the drive up was steep, it definitely was worth it. The views were fantastic. The cabin was the coolest one we've ever been in. Very clean and well stocked. We all agreed to go back, and it will be through Cabins for You." "Stayed in the Mountain Glory Cabin. Loved every minute, had no problems. Will definitely be back again." "Our cabin Mountain Glory was amazing! Decorated perfectly, very clean, very big, stocked up with supplies, great location, absolutely amazing view! Can't say enough about it! 11/10 👍 cannot wait to go back!!" "The cabin was amazing. Really enjoyed the hot tub, the full kitchen, and the view! Very comfortable beds too. Would definitely recommend this to my friends and family!"